Terex Cranes has unveiled the Demag AC 45 City crane, a compact new three-axle unit in the 45-tonne lifting capacity class aimed at urban applications, with a total length of only 8.68 metres, a width of 2.55 metres, and an overall height of just 3.16 metres. This slight height can further be reduced to less than three metres, which alongside its tight radius, help make it ideal for confined and even indoor work environments. Also factored into its design is a particularly compact base section on its fully hydraulic main boom, at just 7.80m metres long, allowing the AC 45 City to work in buildings with a relatively low clearance while keeping its boom at a steep angle. As the 31.2-metre main boom (extendable to 44.2 metres) is fully hydraulic, the crane is also able to prep for work much faster than comparable cranes with booms that need to be set up with pins. Terex Cranes is delivering the AC 45 City with the IC-1 Plus control system, which calculates the crane’s lifting capacity based on its boom position and slewing angle in real time, allowing a crane to exceed the limits of a pre-calculated load chart. The new AC 45 City crane is also designed to stay within a 12-tonne axle load limit, as the three-axle unit does not weigh more than 34 tonnes even when outfitted with its full equipment, allowing it to travel to jobsites without the need for any additional transport vehicles. With a reduced counterweight, the crane actually falls below the 10-tonne limit, while still being able perform a broad range of lifts. It weighs only around 26 tonnes when not carrying any counterweight. When it comes to its setup, the AC 45 City meanwhile features an automatic levelling system that enables the crane to balance itself with computer assistance when the outriggers are extended. The drivetrain comes with six forward gears, one reverse gear, and cruise control, and as with all new Demag cranes being released, the entire machines, including the drivetrain comes with a two-year comprehensive warranty as standard. 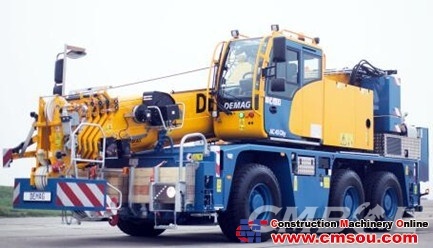 The AC 45 City returns the Demag ‘City’ brand to the market, a decade after Demag launched the AC 40 City, which at the time became the most successful model of this class with over 1,000 units sold.